At St. Bartholomew’s we hold an annual service in November, on the evening of Remembrance Sunday. 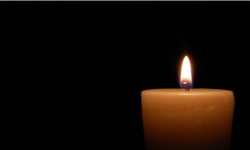 We invite those who have lost loved ones during the past year to this service and the names of loved ones lost are read out, relatives and friends are invited to light a candle in the person’s memory. Our deepest sympathy on the loss of your loved one. God’s love and power extends over all creation and every life, including our own, is precious to Him. Christians believe that all who have repented of sin and turned to Christ have new life and that there is hope in death as there is in life. When a loved one dies even those who share this faith experience a real sense of loss, with their memories and feelings of love grief and respect. The funeral gives us an opportunity to express our faith and feelings as we say farewell, to acknowledge our loss and sorrow, and to reflect on our own mortality. At a funeral we remember the person before God, give thanks for the person’s life, commend him/her to God, commit his/her body to be buried or cremated and comfort one another in our grief. Initially funerals are booked through the Funeral Directors who will liaise with the clergy to make the arrangements. However, it is important to us that those who have lost a loved one are cared for and supported so the clergy are more than happy to be contacted early on in the process to help the bereaved in what ever way we can.